There is nothing quite like a sugar cookie. They are simple, yet so delicious almost no one can resist having one and they are literally perfect for almost any occasion! The only downside to a sugar cookie is the time it takes to roll and cut them out into shapes. 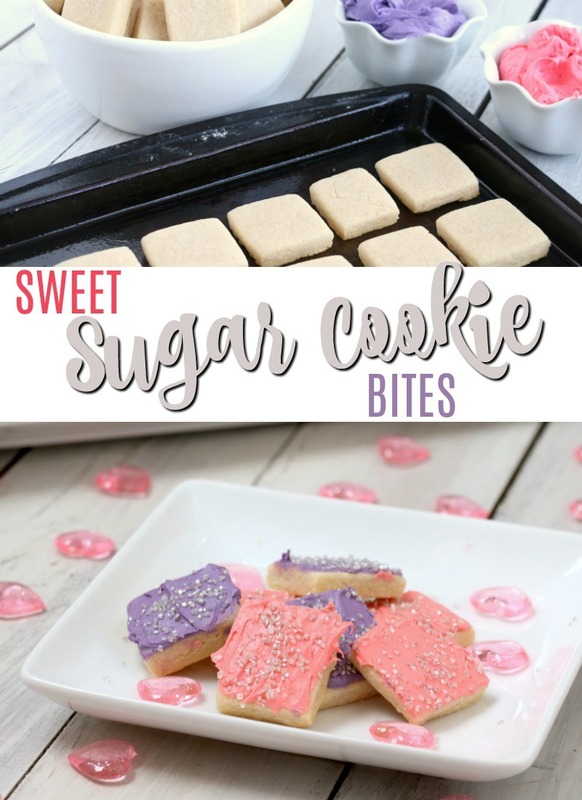 If you are too busy to make cut out cookies you are going to love this recipe for Sweet Sugar Cookie Bites. This cookie recipe comes together easily and make a cookie that is so delicious and pretty, no one will miss the fun shapes! I love the small size of these Sweet Sugar Cookie Bites because they are perfect for an afternoon pick me up. Sugar cookie bites are also the perfect size for small hands, if you have the chance to share these with the kids. They are the perfect size for sharing at school or a party. Cream the butter and sugar together just until smooth. Add vanilla and eggs. Mix completely. Add baking powder and flour. Mix until uniform. Roll doug out on a floured surface to about 3/8″ thick. Using a pizza cutter, cut dough into 1″x1″ squares. On a greased baking sheet, bake at 350 degrees for 6-8 minutes or until edges turn light brown. Allow cookies to cool before decoration. Add desired food coloring to buttercream frosting. Decorate cookies using frosting and Sprinkles of your choice. How often do you make sugar cookies? Do you prefer to make them cut out or like drop cookies? When you make these Sweet Sugar Cookie Bites I would love it if you would share a photo of them with me on my facebook page. 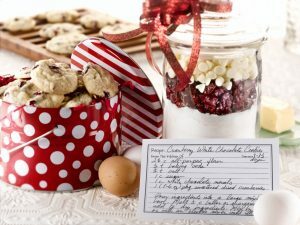 If this recipe tickled your taste buds and you are in the mood to bake, you won’t want to miss my recipe for Cranberry White Chocolate Cookies.